If this is your first time reading about this bike, check out our initial impressions on the Dahon Mariner D7. So the time has come… to tell you all about the hair-raising adventures I’ve had on the D7! And… that time is now over. Because there really weren’t any. Sorry… you can take another sip of your beverage now. And close your mouth, the popcorn’s about to fall out. What I WILL say is that this bike has been rock-solid, and has introduced into my life the idea that maybe I should have a folding bike permanently. Because it’s been pretty sweet! 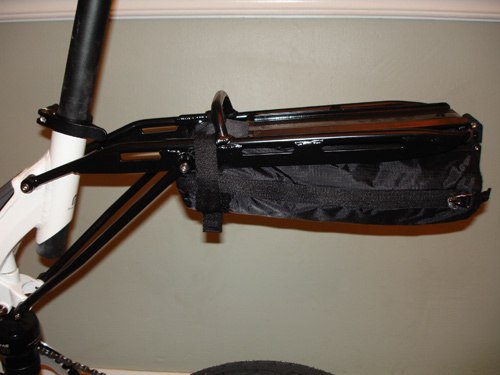 It has continued to be easy to use (biking, folding, unfolding, lugging around) and hasn’t needed any maintenance to speak of. The only issues have been with fenders getting bent out of shape due to bad packing in the car (fairly easily bent back), and once when the handlebars somehow got spun all the way around and braking was wonky for a couple minutes ’til I realized what had happened. So… yeah, user error. 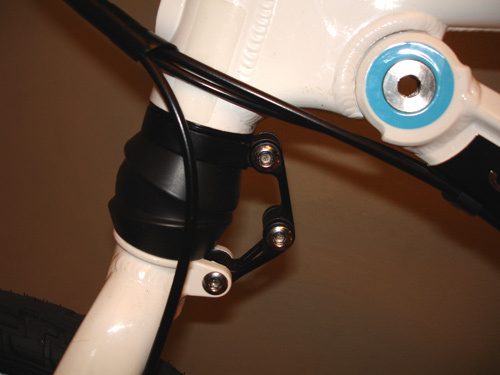 Speaking of user error, in the initial review I said there weren’t bosses for a bottle cage. That was incorrect: there are, I missed them somehow, and they’re on the top of what would be the top tube if there were more than one tube. So ignore that complaint… it’s invalid! 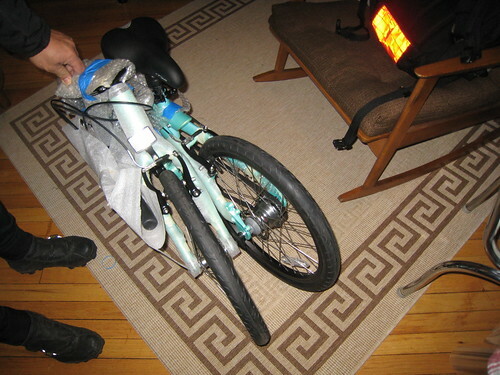 Since the initial review, this bike has been in and out of cars, to the library, to the grocery store, and just generally wherever we need to ride. The one thing I haven’t yet done on this is take it on public transit… I simply haven’t headed DC-wards recently, so I can’t say how it is. I imagine it would work fairly well, but can’t 100% verify. My wife and I both like it, and because it’s easy to hop on and go, it’s one of the first picks out of the garage. 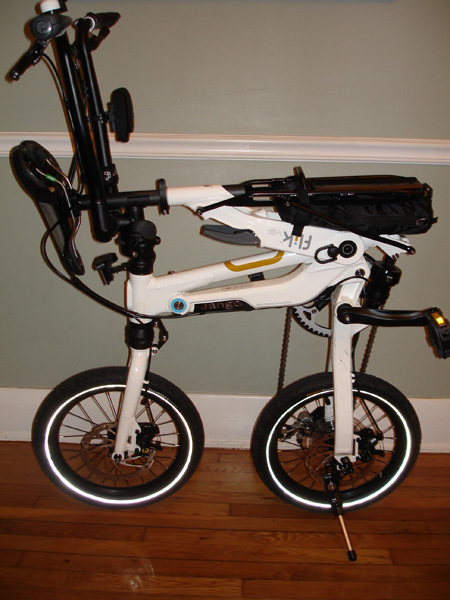 My wife also had the amusing experience of using it when she had to drop the car off for some maintenance – and seeing all the car repair guys watch in amazement as she pulled the Dahon out of the backseat, unfolded it, and rode off to do a couple errands while she was waiting. Apparently they’re not used to that! I really enjoyed my (short) time aboard the Mariner. 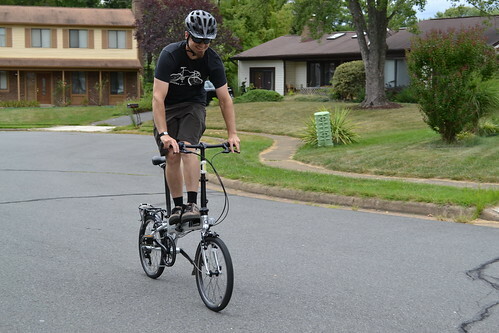 I have a soft spot for folding bikes, although there’s not one in my bike fleet currently. 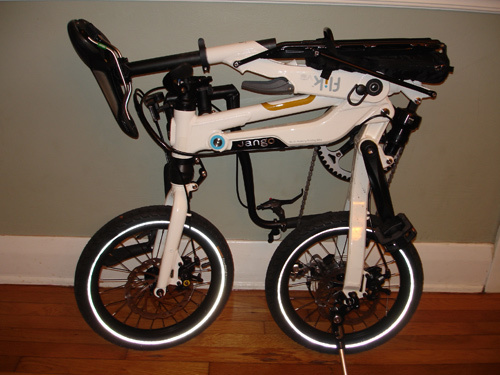 For multi-modal commuters, or people who live in small apartments, a folding bike makes a lot of sense. 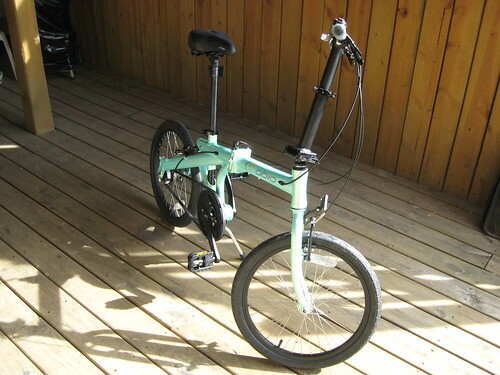 And this Dahon really fits the bill. 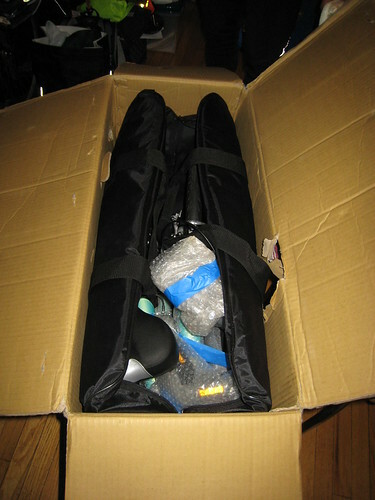 I didn’t try my own hand at folding the bike, but Matt demonstrated the ease with which it folds up into a tidy package. 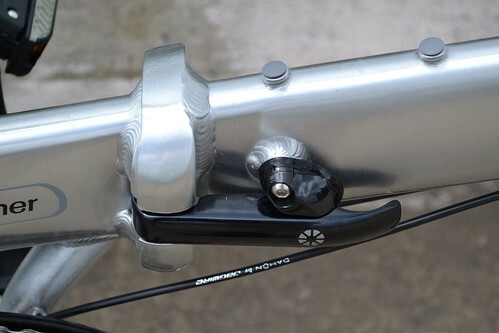 One of the things I noticed during the folding was that the seatpost didn’t have reference marks etched into it; the lack of those marks means that getting your saddle height right the first time is a bit of a challenge. A strip of tape or a silver Sharpie marker makes short work of that omission, however. 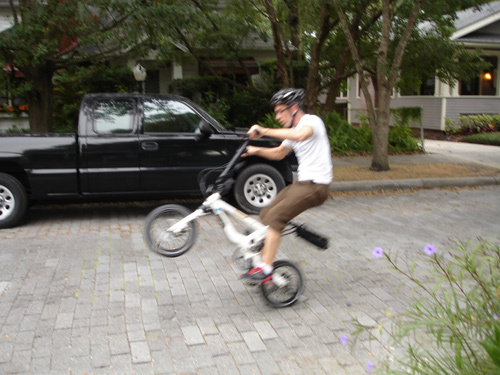 As with most small-wheeled bikes, the Dahon accelerates quickly. 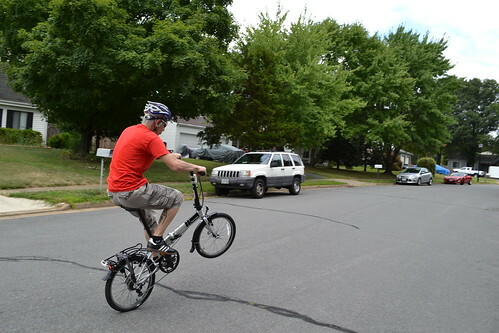 It feels really nimble while riding around city streets and tight spaces, too. 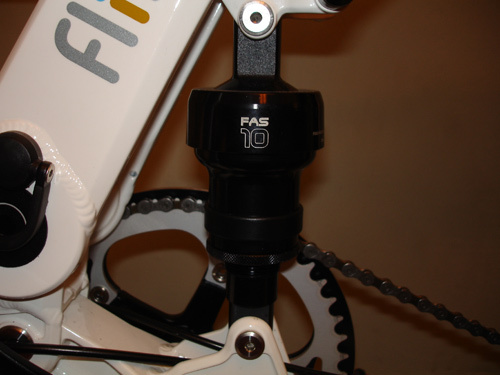 Gearing was adequate for around-town use — we didn’t get to try it on any monster climbs, but it handled the inclines of northern Virginia without too much effort. Standing up to pedal up a rise was, well, rather awkward…that’s the only time when the short wheelbase and compact fit were an issue. The overall fit and finish were excellent, and there weren’t any mechanical problems throughout the duration of our review period. 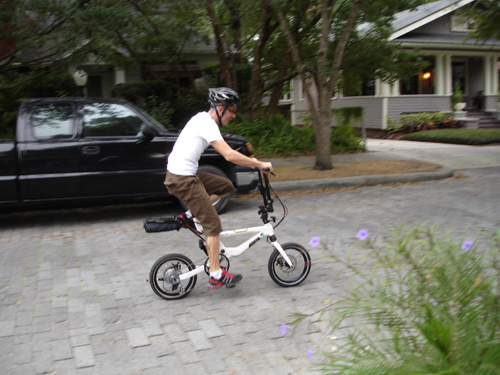 Overall, the Dahon Mariner makes a great choice if you’re in the market for a folding bike. Did I mention we had a lot of fun riding it? You also wish you had these skills. 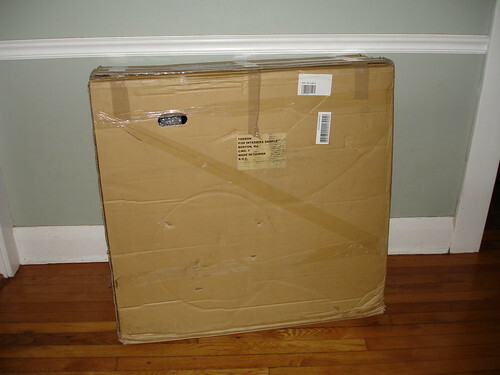 What a great way to start the day — opening up a package! It’s so compact, yet it’s 95% assembled right out of the box. Within minutes, my new “ride” to work is ready to go. 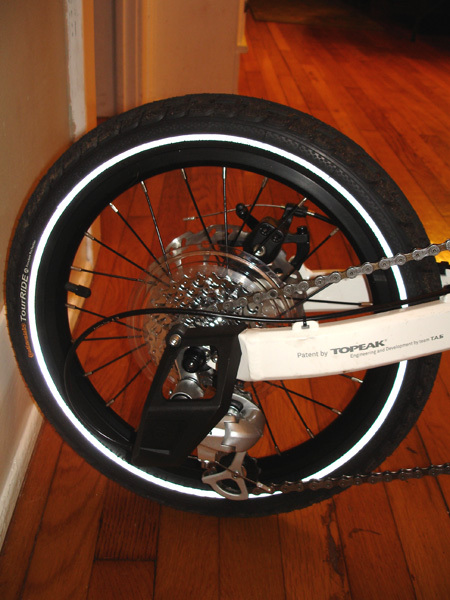 I’ll let you know in the coming weeks how this new Abio Verdion stacks up against my full-sized commuters. It already has one major advantage — folding down! I put that folding capacity to the test as I squeezed and wiggled my way (literally) through a public transit turnstile gate (with just enough room for me and this Abio).